Rad Dads is proud to host in collaboration with The Boneyard Skatepark a night just for dads including skateboarding, live music and more. We will also be collecting donations for Boards for Kids Edmonton; a group that gets skateboards into the hands of unprivileged youth. See our event page for more details. RAD DADS SHOW EPISODE 6!! Yep it's been way too long since we've updated this section but it's not from lack of trying. Fatherhood is busy and we just don't always have time to get this updated, we have however been updating our Rad Dads Show section. We are now at Episode 6 and have four more interviews to edit for you. We have sat down with some super Rad Dads and we hope you are enjoying the conversations. If you have any suggestions on who to talk to next do not hesitate to contact us. Now head over to the Rad Dads Show page and listen to Episode 6 with former Edmonton Eskimo Graeme Bell. Meeting No. 2 - Theme "Music" - Guest speaker was Terry from the smalls. "Bowling, Boyle Street and Beer @ Plaza Bowling Co.
On the evening of November 27th Rad Dads partnered up with Plaza Bowling Co. to toss some strikes, drink some beer and collect some donations for Boyle Street Community. Blindman Brewery was also on hand to provide us with some samples of their tasty brews and even gave away some rad swag. 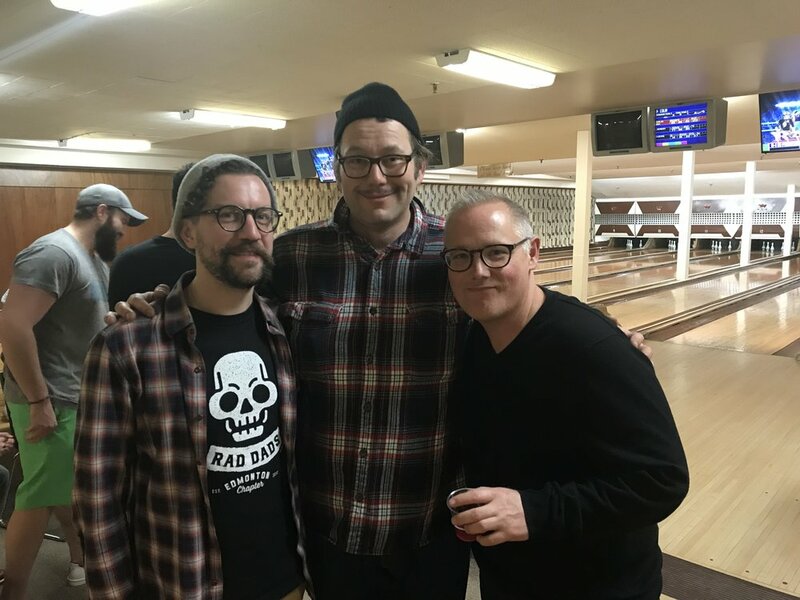 Rad Dads wants to thank Trevor from Plaza Bowling for opening up show for us, Kirk from Blindman who has been a supporter fo Rad Dads since day one and all of the dads that came out to knock some pins over. Scroll through a few of the images from the night below. In the meantime and in between time, stay rad. Rad Dads has received a thank you note from Santa's Anonymous for the donations given to them after our Halloween Monster's Ball so we thought we'd share. Thanks to all the awesome Moms and Rad Dads that came out and brought a donation. In the meantime and in between time, stay rad. Thank you. Two simple words that mean so much. Because of you, less fortunate children all over Edmonton will wake up to new toys on Christmas morning. It has been a difficult few years for many Albertans and some families who were once in a position to donate have found themselves in need of assistance for the very first time. It can be a humbling experience for them. Michael’s family was one of these last year and his mom sent a note we would like to share with you. Donations like yours make a difference in the lives of so many in the community. There are countless other examples like Michael's of how your gift inspires generosity in future generations. You can read more stories like Michael’s and get regular updates on 630 CHED Santas Anonymous by signing up for our newsletter at www.santasanonymous.ca. From all of the elves and the 630 CHED Santas Anonymous recipient children and families a most sincere and heart felt thank you! The morning of November 18th saw the Apple Store West host some Rad Dads and Kool Kids in a Sphere robot coding challenge. Facilitators Ritchie and Sheldon lead the group on the basics of coding a Sphero robot and then provided some challenges for the participants to work through. Some of the kids beat the challenges and others struggled but never gave up and had a tonne of fun. Thanks again to Spencer, Ritchie and Sheldon for having us out and providing the kids with some insight into coding, fun and of course the cool swag. We will be back! October 29th saw Rad Dads host its first (hopefully) annual free family-friendly Monster's Ball costume party at 9910. We had many little ghosts, ghouls and goblins come out for an afternoon of halloween inspired crafts like pumpkin decorating, mask making and our personal favourite paper circuits (scroll through the pics to see more). We also managed to raise some money for Santa's Anonymous thanks to the donation of a mini scooter by Sean of Wheelz Scooter Shop in St. Albert and lets not forget all the unwrapped toy donations from everyone that came out. We hope you all enjoyed the afternoon and hope to see you soon at our next kid event - Creative Coding. In the meantime and in between time - stay RAD! October 18th saw a bunch of "new" and "old" Rad Dads coming together for "The Summit" event at Dirtbag Cafe. We had the opportunity to go bouldering in their climbing gym, had a quick craft beer presentation by Coulee Brew Co. from Lethbridge, enjoyed delicious barbecued Bahn Mi burgers from one of our raddest of dads Scott and ended the evening with an engaging talk on mental health by German Villegas of Modern Manhood Podcast. Overall a smashing success! Rad Dads wants to thank all that came out, Quentin for the support and offering up space in Dirtbag Cafe and Rock Jungle Boulders, Scott for the burgers, Coulee Brewing Co. for the beer education and finally German for his willingness to speak to us. Hope to see you at our next event. In the meantime and in between time - stay RAD! So what is Rad Dads and what are we about? As for now we are a group of fathers that have a goal of promoting and modelling positive parenting, empowering dads and encouraging them to be involved in the lives of their children. As an attempt at reaching these goals we set out to host quarterly “dads-only” meetings centered around some sort of theme. These meetings are a place where we can potentially share experiences and hopefully learn something all in an informal setting while washing it down with a cold brew. We have had two of these meetings; the first one had a theme of building, as in building the community of Rad Dads and the second meeting we had music at its core. 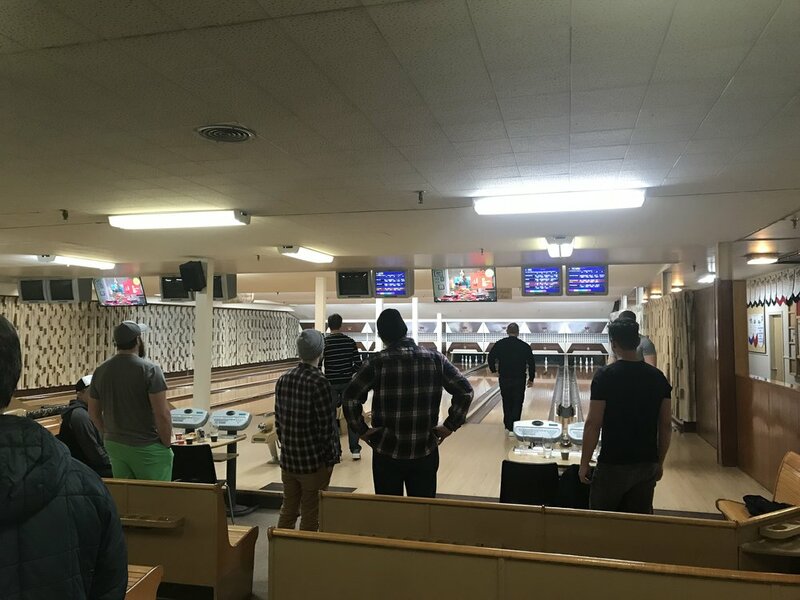 We've structured the meetings as follows: reaching out to some craft brewery to provide a cask for the night, some form of entertainment, collecting donations for a local charity and then end the night with a guest speaker centered around the theme and someone hopefully that relates to dads or is in fact a dad themselves. In the months between the dads meetings we have organized what we call Kool Kid events. These are meant to tie back to the prior dad meeting theme and be an all-inclusive family friendly (moms welcome) event for parents to have fun doing something different with their kids. The first Kool Kid event was what we called “Build & Bond” Lego Party. Essentially a Lego free for all building marathon that included an animal balloon artist and other goodies. The second Kool Kid event was on June 18th and was a family-friendly “rock concert” on Father's Day that had live music, dancing and prizes. We have also hosted some pop-up events in conjunction with local businesses that have reached out to us and want to get involved in our mission. Some of the pop ups included Whiskey Tasting at Have Mercy, Macaroni Madness Art Project at Cartago and "The Summit" rock climbing event at Dirtbag Cafe just to name a few. And finally to fulfill our community outreach goals we have been involved with some community groupssuch as the City of Beaumont FCSS and Terra Centre. They reached out to us and asked us to come out and be present at their hosted events and we obliged. To cater to their needs we have created a kid friendly stomp rocket activity that kids (and parents) can do in order to have fun, learn some science and bond. Thanks for you for visiting our site and we hope to see you out at some future events.